The Stadio dei Marmi (Italian: "Stadium of the Marbles") is a sport stadium in the Foro Italico, a sport complex in Rome, Italy. It was designed in the 1920s as a complement to the annexed Academy of Physical Education (now the seat of CONI, Italian Olympic Committee), to be used by its students for training. Originally designed by Enrico Del Debbio, construction was completed in 1928. 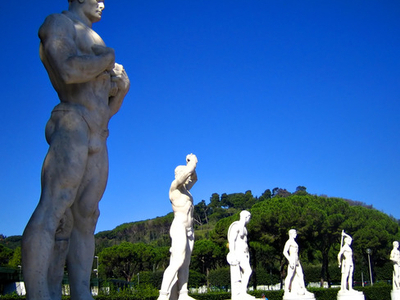 It has Carrara marble steps lined by 59 (60 in the original project) marble statues in classical style portraying athletes, each offered by the provinces of Italy. The stadium was inaugurated in 1932. It hosted some of the field hockey preliminaries for the 1960 Summer Olympics. Stadio dei Marmi was also the host for the 2009 World Aquatics Championships opening ceremony. Here's the our members favorite photos of "Stadiums in Rome". Upload your photo of Stadio dei Marmi!